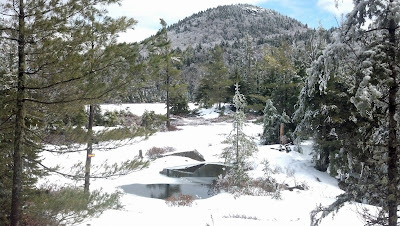 Last month I entered the lottery for the ADK Adopt-a-Leanto Program. There were close to 20 leantos up for adoption this year. The procedure was to submit the request with up to 3 choices from the available list. 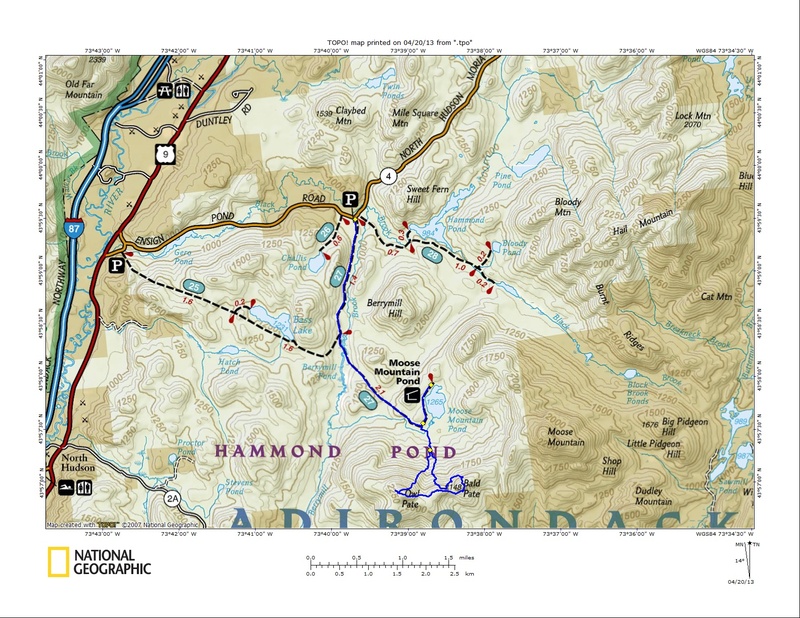 I was excited to see that one of my favorite leantos, Herbert Brook, at Flowed Lands, in the Adirondack High Peaks Wilderness Area was available. I submitted that as my first choice along with a second and third choice. I really didn't think I'd get my first choice, but I was hoping that I'd get one of the three. Leesa and I received the new leanto sign-in register in the mail last Friday so we decided to not waste any time in getting out to the leanto to place the register and and make sure the leanto was ready for Spring guests. The weather on Sunday was perfect, so we parked at Upper Works, near Newcomb, and hiked the 4.8 miles on the Calamity Brook Trail to Flowed Lands. 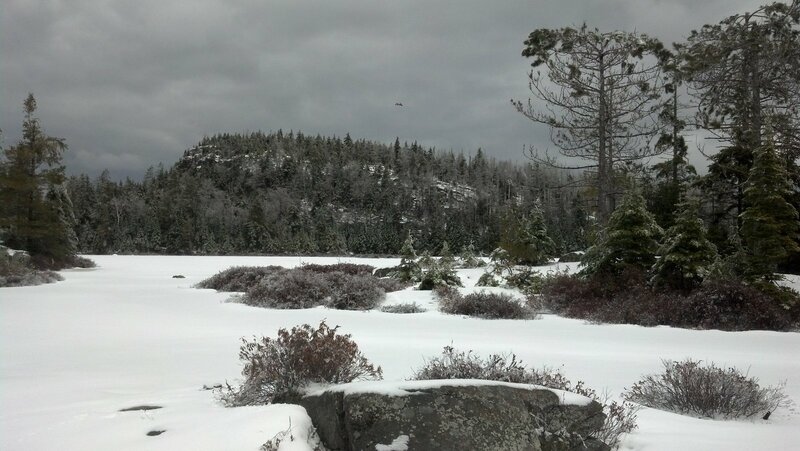 In the winter, you can cross Flowed Lands on the ice and be at the Herbert Brook Lean-to in 10 minutes. The rest of the year, you have to take the trail along the west shore. As you can see below, there was still a fair amount of snow in the woods. Fortunately, it was 26 degrees when we started out, so the snow was frozen. We wore Microspikes, but carried snowshoes in case the snow started to soften. We reached the lean-to after another .7 miles or so. It is in great condition. We are hoping it will stay that way during our tenure as adopter. We left the register in a ziplock bag, along with some pens and pencils. Please sign in and leave your thoughts! If anyone sees any problems at this lean-to, let me know, and I'll go out and check on it. Right now it's quite muddy out front, but it will dry up in the next couple weeks. In perfect shape and ready for guests! Once we were satisfied that the lean-to was totally clean, we wandered over to the Opalescent River, where we could get a good look at the MacIntyre Range and Mount Colden. 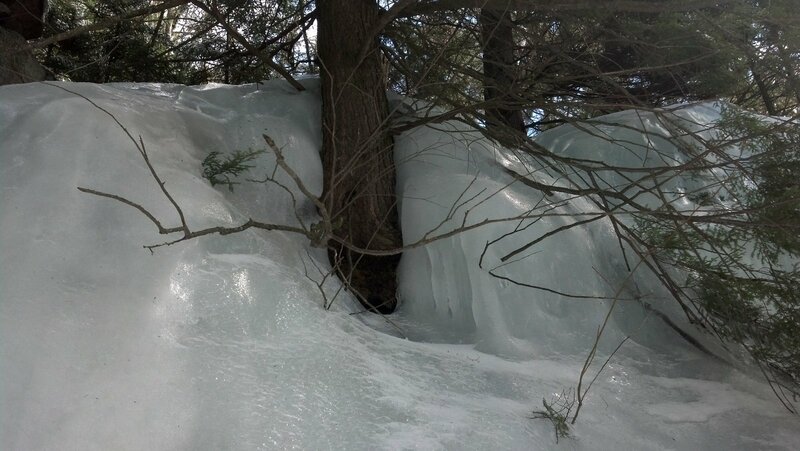 The snow on the rocks by the water has melten and just some chucks of ice remain in areas where it is mostly shady. 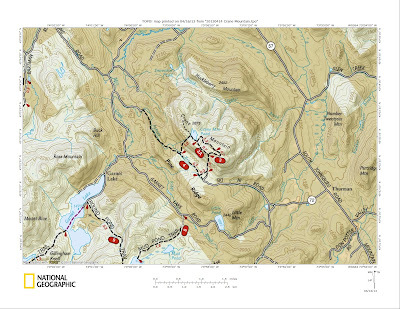 Next we continued along the west side of Lake Colden past the McMartin, Beaver Point and Cedar Point leantos and over to the ADK Interior Outpost, a beautiful Ranger facility. There is still ice on Lake Colden, but it is no longer safe to walk on. No one was around the Outpost. 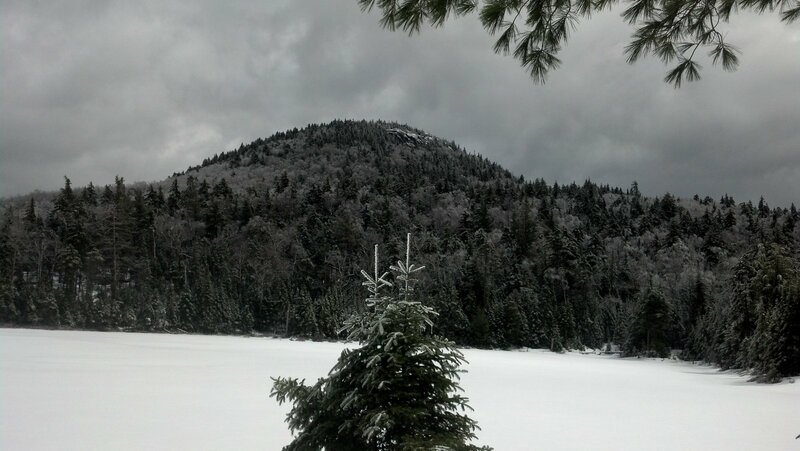 We walked to the water's edge and enjoyed the view of Mount Colden. It was a nice bluebird day. The temperature warmed up to around 40 degrees, but the snow remained firm on our way out and we didn't need the snowshoes at all. Be sure to visit the Herbert Brook Lean-to! It's a great spot to camp and a great spot just to stop and enjoy the views and have a snack. Please keep it clean and pack out what you pack in. 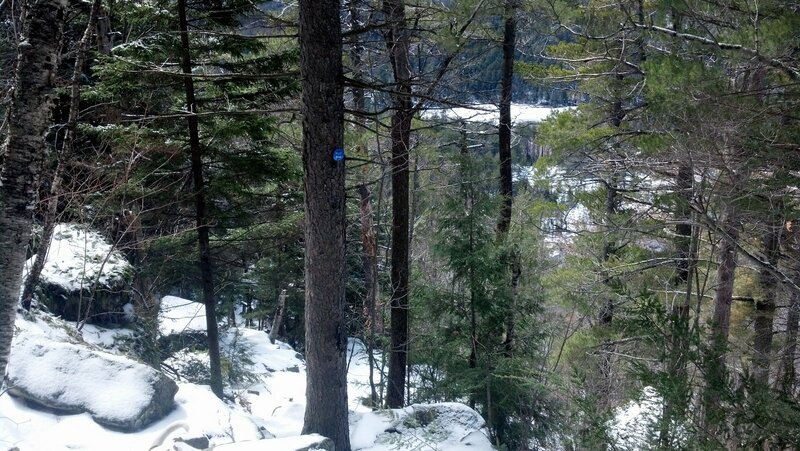 It was time to get out for my first bushwhack hike of the season. I had heard good things about Owl Pate and Bald Pate in the Hammond Pond Wild Forest, just south of Moose Mountain Pond. It was a good fit for my Friday, since I was getting a late 10:15 start. 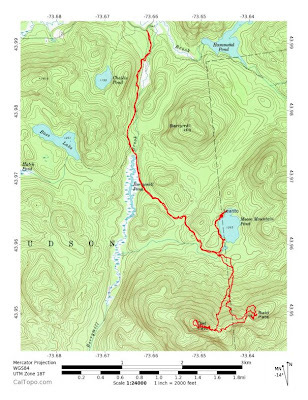 My route was to hike from the trailhead at Ensign Pond Road, off of Route 9, near Exit 29 of I-87, to Moose Mountain Pond and then bushwhack from there. The trail portion of the hike was 3.2 miles to the pond. I arrived there at 11:30. I was disapointed to find some litter at the leanto at the pond. There was a bag of garbage and 2 full water bottles in the fire ring, some pine boughs in the leanto and a pair of camouflage pants and sweat pants, along with some greasy pans and newspaper. This was my 2nd time past this leanto, and both times there was garbage here. It's too bad because it is a nice spot. I packed out some of the garbage. 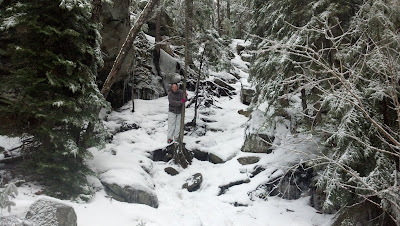 On the way to the leanto, trail conditions were a mix of ice, snow and bare ground. In the distance on the picture below is the Bald Pate - Owl Pate ridge line which was my destination for the day. 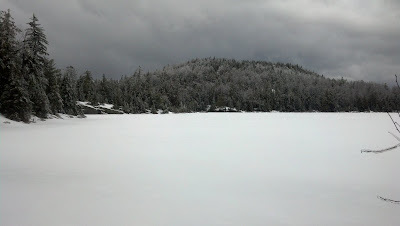 After enjoying Moose Mountain Pond, I went back to the outlet and crossed over to begin my ascent to the ridge. As I made my way up to Bald Pate I reached the snow line about halfway up at around 1700'. There was about 18" of snow on the north facing slopes of the ridge. I had expected the ridge to be fairly open, and an easy bushwhack, but I encounter some fairly thick pines and lots of blowdown. It took longer than expected to reach the ridge. Both the Bald Pate and Owl Pate actual summits are in the trees, but both have viewpoints from south facing ledges. Schroon Lake can be seen in the distance to the southwest. It took about 40 minutes to go from Bald Pate to Owl Pate. The ridge was a mix of hardwoods and softwoods. The softwoods were not pleasant to work my way through, due to the blowdown and the deep soft snow that was still around. 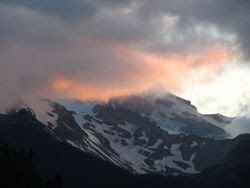 I had expected the summits to be a little better than I found them to be. Don't get me wrong, any day in the woods is a good day, but I guess the talk I had heard about these summits led me to expect more. On my way down from Owl Pate, I headed headed pretty much north-northeast at about 20 degrees on my compass. 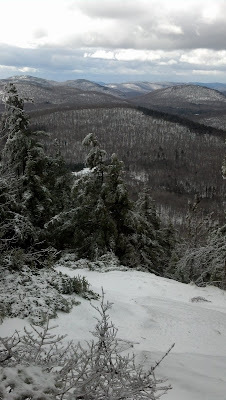 The north slope was open hardwoods, but the deep soft snow made the descent tough. I was soaked right through. The temperature was warm. It was 55 degrees at the start, and 65 at the finish. I was back at the car at about 4 PM. Crane Mountain is one of those special places. Where else in the Adirondacks can you find a high plateau that boasts a mountain pond and a rugged peak both on top of the plateau? 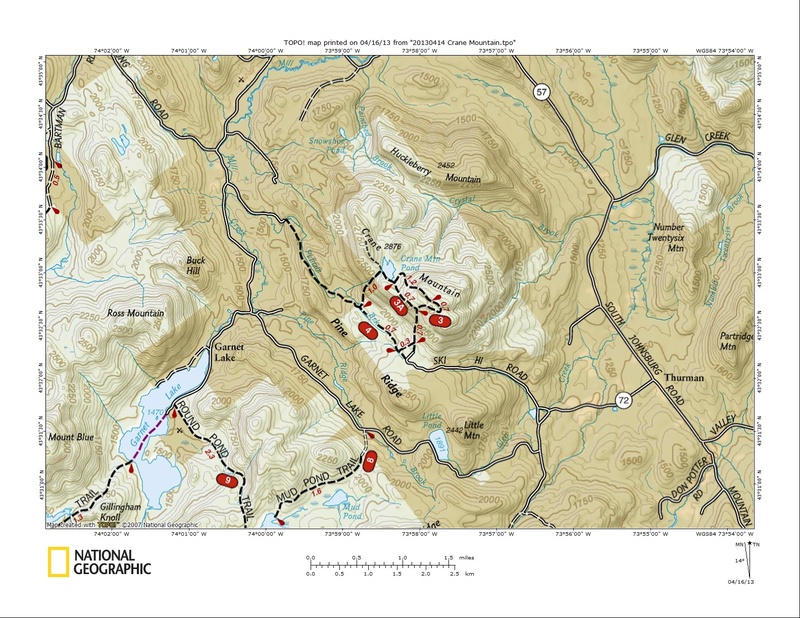 The area is contained within the Wilcox Lake Wild Forest and lies minutes northwest of Warrensburg, NY. Don’t be fooled though. 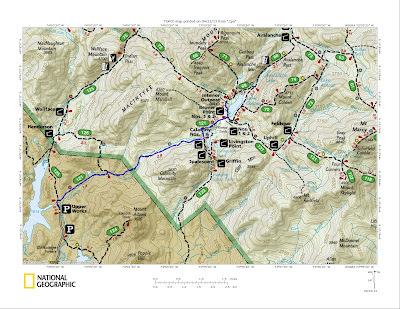 You’ll need a map to find the area and the road to access the trailhead, Sky Hi Road, turns to gravel and climbs to 2000 before ending. The last .4 miles is not plowed in winter and is often suitable for 4 wheel drive only. 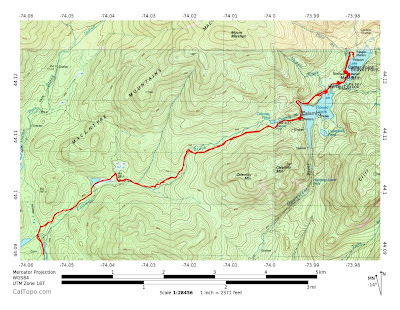 From the trailhead, a loop hike is possible. 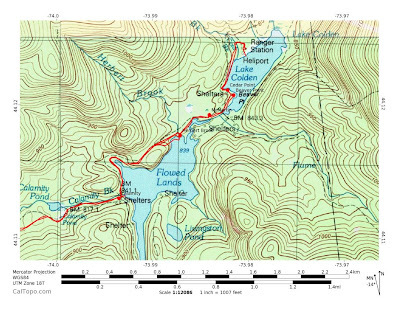 Counterclockwise is the shortest route to the summit. 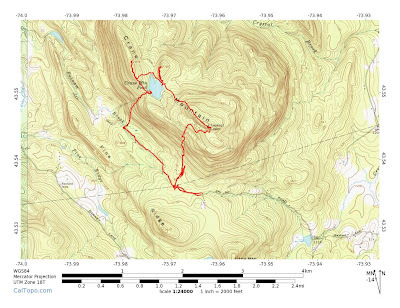 To access the pond, you can either follow the summit route to the plateau where the trails splits left to the pond or right to the summit, or take the clockwise loop by following the old jeep road trail along Putnam Brook before climbing to the plateau and the pond. 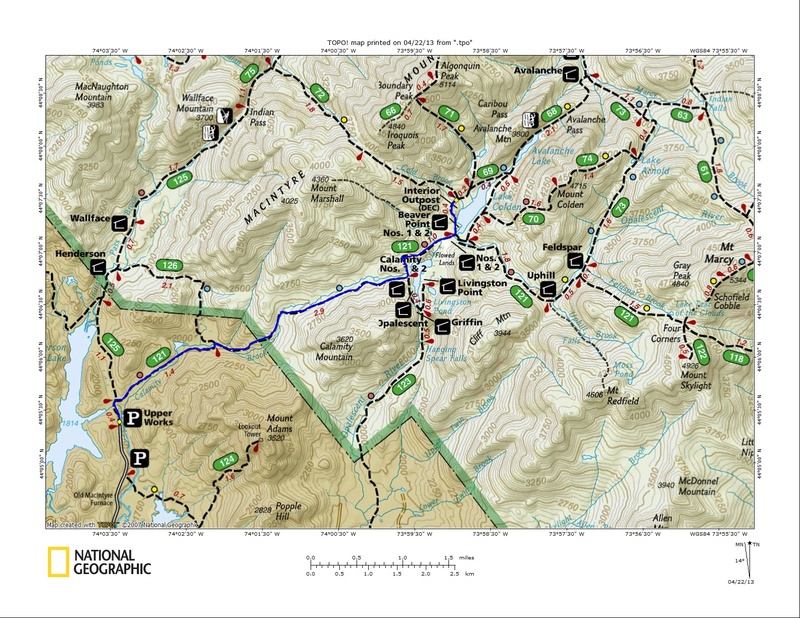 Either route involves a steep climb to the plateau, which lies at approximately 2600’. If you wish to take the shortest route to the summit, you have to negotiate 2 ladders. 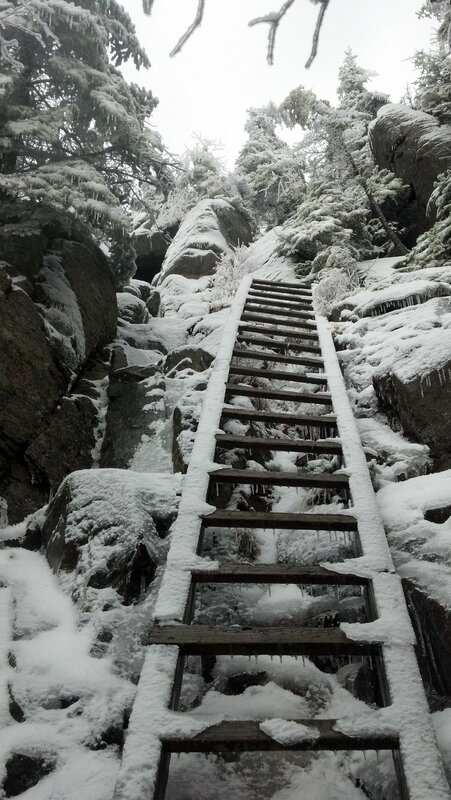 A small ladder of about 6 rungs, and a much taller 25 rung ladder on the last incline before the summit. The tall ladder is held in place by a steel cable, but it can still be scary for those afraid of heights, or if the ladder and surrounding rock are iced up. 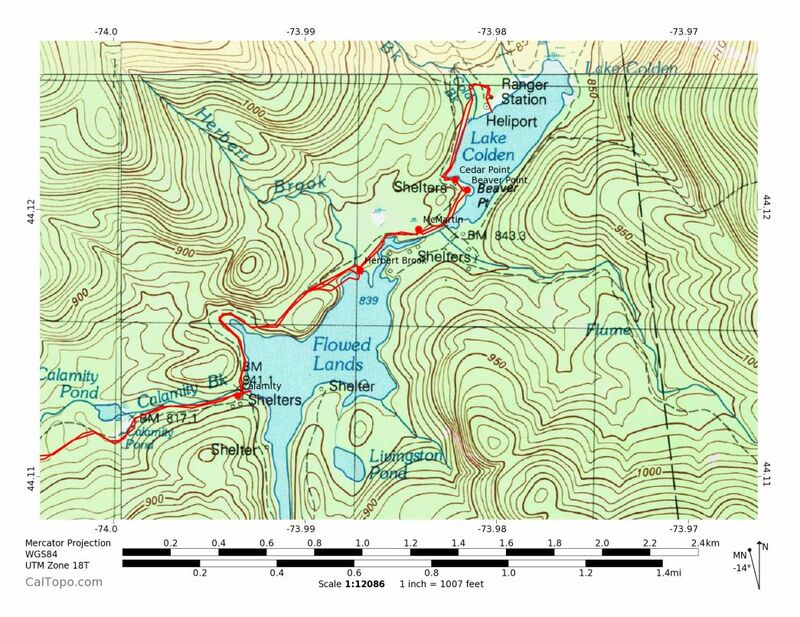 We took the counterclockwise loop choosing to hike to the summit first. We had a mix of sun and clouds with temps in the high 30's. 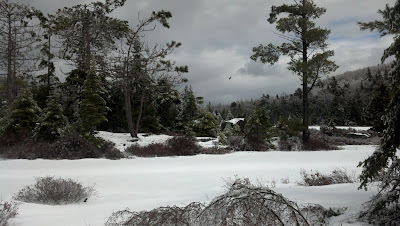 There was snow, even at the trailhead. We put on our Microspikes right away, and they stayed on the entire hike. The snow was soft on the south side, but firm and still deep on the north side. 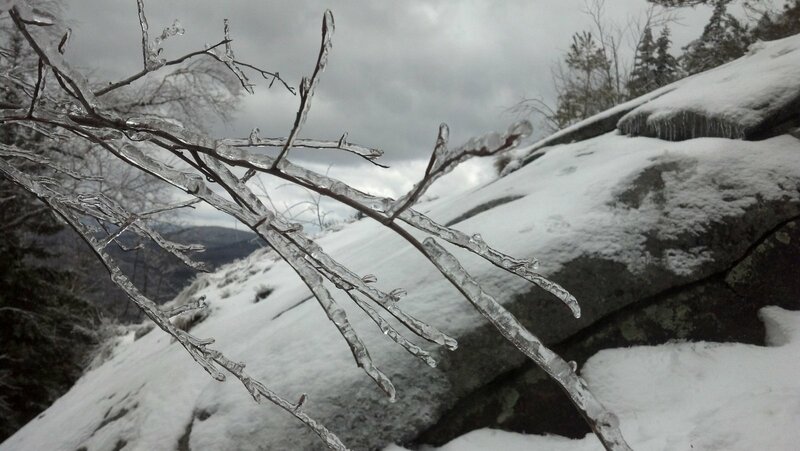 The summit provides great views to the south from a rocky ledge. From the summit you can continue the loop and go to the pond, or return. 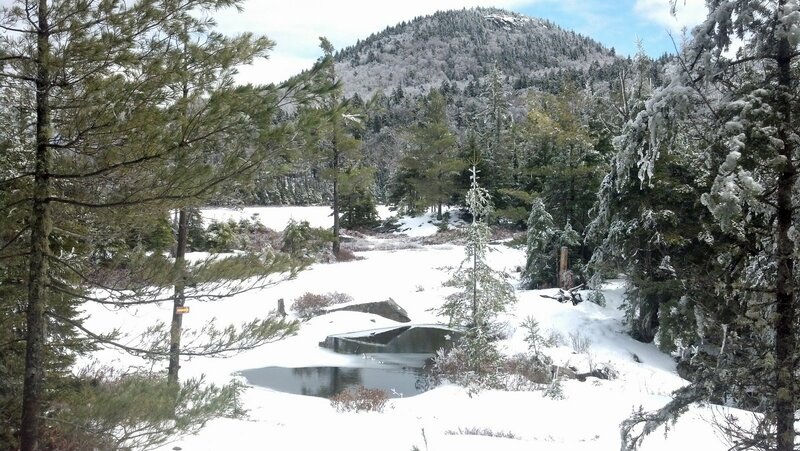 We went to the pond, which was still frozen and covered in snow. We didn't test the ice to see how thick it was! At the pond, we had a mix of sun bursts and dark clouds. 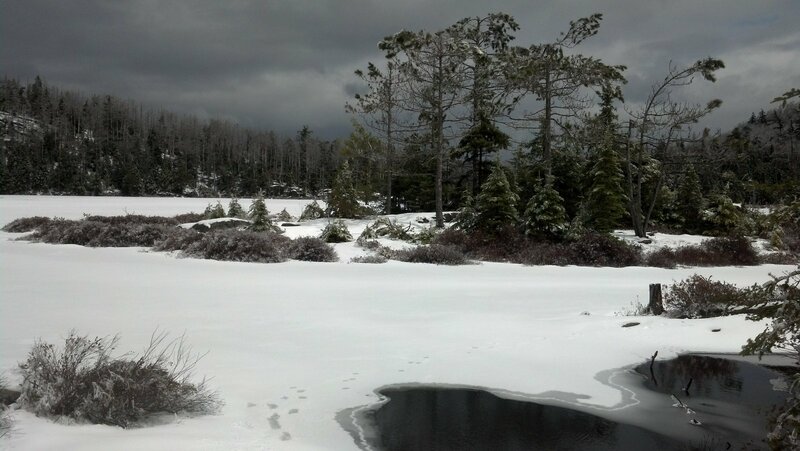 This was my 2nd time to Crane Mountain and Pond, but Leesa's first. I still haven't been here in summertime, but I intend to come back to see the pretty pond, perhaps in the fall. 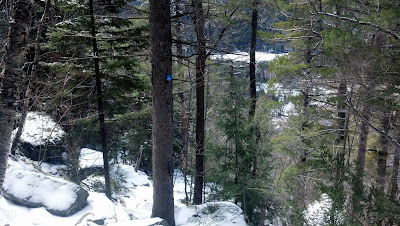 From the pond, we took the blue trail which quickly turns into a steep descent to Putnam Brook. You pass a nice long water slide on the way down. 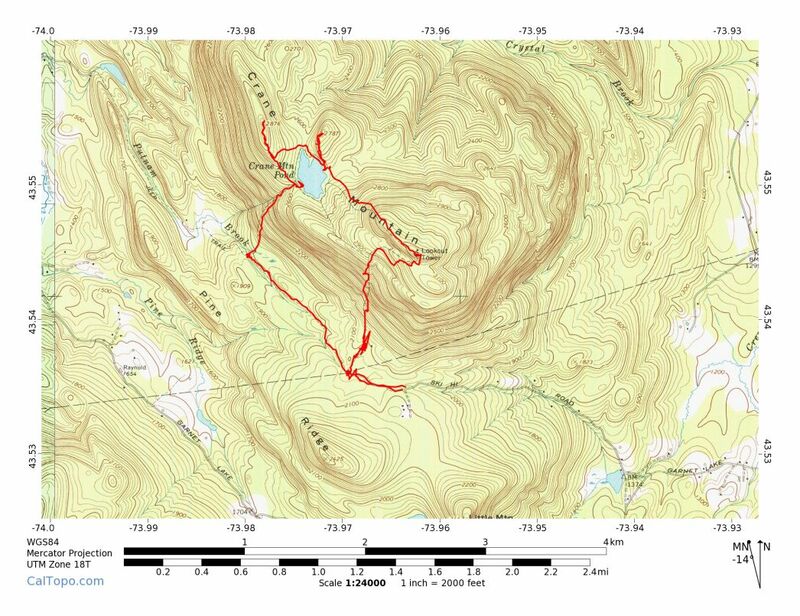 Once down at Putnam Brook it is an easy mile walk on a slight uphilll back to the trailhead. I find this whole area to be quite impressive and well worth a look. We'll be back.